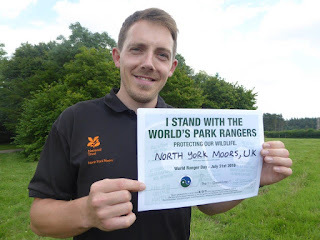 This Sunday (31st July) marks a celebration and moment of reflection for the world’s rangers – doing the ‘work that matters’ (Harvey Locke, 2016). Most of us here in the UK and Europe will go home at the end of the day. For some rangers, who work in some of the world's most dangerous protected areas, they put their lives on the line on a daily basis, and sometimes sadly lose that battle. The International Ranger Federation puts together a roll of honour for those that have died since the previous years’ World Ranger Day. This year, that figure hit 107. And these are the figures we know about. Since 2009, 595 rangers have lost their lives in the line of duty. 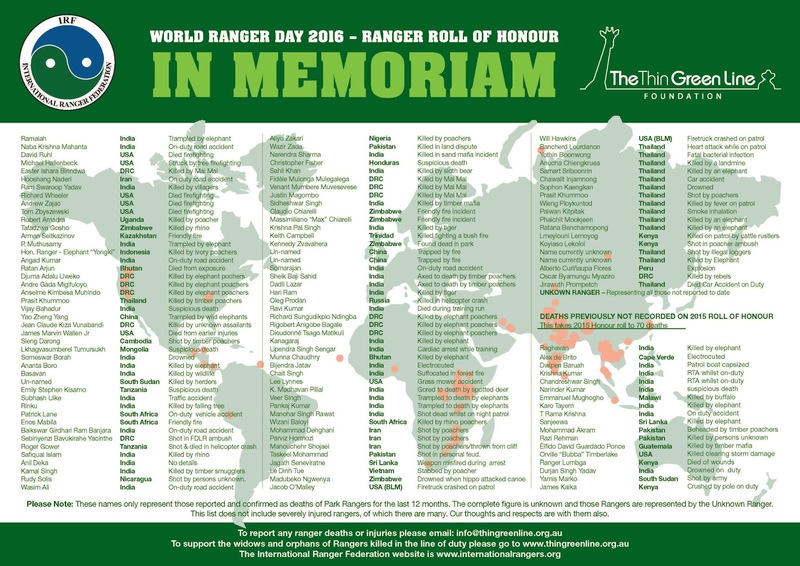 Ranger roll of honour - in memory of those that have lost their lives in the course of their work between 2015-16 compiled by Roger Cole of the International Ranger Federation. As rangers, we are so lucky to do the work that we do, protecting special places, protecting wildlife (however small) and sharing these special places with the next generation. To have lost so many this year alone is very harrowing. The main causes of death this year were poaching (42%), work related incidents (41%) and by the very animal’s rangers protect (17%) - the majority from the Asian and African regions. Brave men and women who have made the ultimate sacrifice to protect wildlife, culture, history and communities. Let’s show our support for the world’s rangers. Visit the IRF website to print off a copy of this banner, have your photo taken and show your support by sharing on the International Ranger Federation Facebook page or on twitter at thingreenline1 #worldrangerday #standwithrangers #naturesprotectors #thingreenlinefoundation #internationalrangerfederation. To UK rangers: If you’re a ranger reading this, remember what may seem like 'just the day job' is actually vital and important in the bigger scheme of things. Think of the world as a ‘terra national park’ – looking from outer space, there are no boundaries, no state borders, no designated national park areas, just one planet. We are all doing our bit to protect it. 'I want to talk about where home is for all of us. Earth. This is our home. And I want to say this. No one, in the world, is doing more important work than rangers, looking after Earth. The Earth needs rangers. Rangers can lead the charge.' Harvey Locke, conservationist. ‘I STAND with you, and I stand for you, on this day and every World Ranger Day’ – Sean Willmore, President of the International Ranger Federation. Think about supporting the work of The Thin Green Line. There was a lot more to Beatrix Potter than just the famous storybooks. Her legacy and influence extends far beyond these and is still important to the National Trust today. This month we are celebrating her 150th anniversary right across the Lake District and the whole country. Find out more about what she left the National Trust and how we are continuing her work today in this video, produced by Rangers on the South Lakes team. Here at High Wray Basecamp we’re continually striving to offer our visiting groups and volunteers a more rewarding and memorable stay. One of the ways that we do this is by looking at our infrastructure and seeing what improvements we can make that will add to people’s experience. What needs modernising? What need’s chucking out? That’s why we’ve recently installed a new macerator in our Longland dormitory, and a new cistern and flush control system in our Acland block. ‘Oh, the glamorous world of Basecamp!’, I hear you cry. Getting started: Footprint for the fire pit laid out and materials on site for the wall. Outer walls going up: It was a challenge here to marry the appearance of a 'drystone' wall with the strength of a bonded one. For many years groups at Basecamp have enjoyed a good camp fire - sitting around late into the evening, telling stories, gazing wistfully into the flames. It’s one of the simplest of life’s pleasures, and a way of reconnecting with the less complicated lives of our ancestors, of eschewing for a moment the capricious frenzy of modern life. It’s part of what Basecamp’s all about. Laying the inner firebricks and fireproof screed: These fellas can withstand temperatures in excess of 1350c - that's one hot potato! But there’s been a problem. With no formal, defined space in which to have a fire there’s been no limit on their size. Conflagrations have spread over a larger area than perhaps we would have liked, leaving an ugly pile of ash and cinders in the middle of the Basecamp grounds. There’s the additional concern that during dry spells the fire could ignite surrounding vegetation, with potentially disastrous consequences, or that rocks within it could explode, throwing dangerous shrapnel outwards. Pointing up the firebricks and slate seating: The holes are for ventilation and drainage. And, there’s the issue of dead wood. If you’re ever fortunate enough to visit forests in remoter parts of the world, out of the reach of human influence, you’ll notice an awful lot of dead wood. This plays an important part in the health and vitality of woods. It’s a home and food source for all sorts of animals, plants, and fungi, and as it rots it replenishes the soil with vital nutrients. Decades of camp fires have stripped the Basecamp grounds of most of its dead wood, leaving a depauperate environment. Of course, we’re not suggesting that we can turn our grounds into a pristine ecosystem, and we certainly don’t want to stop people enjoying a good burn up, but by managing what is used for campfires we’ll hopefully be able to give nature a helping hand and keep Basecamp lovely for future generations. Our finished fire pit! We had to have an inaugural burn to cure the fireproof bricks and screed, and bring it slowly up to a working temperature. Here's to many happy future camp fires at Basecamp! Hello There! My name is Ben and I am VERY excited to say that I’ve recently joined the South Lakes upland footpath team. I have a passion for the fells as they’ve been a great source of enjoyment for me and I’m looking forward to contributing to their conservation and maintaining the footpaths whatever the weather. It is exactly one month since I started with the team and what a month it’s been! I’ve had the pleasure of working with Joe, Sarah and Nick, with them I’ve been learning some of the techniques involved in upland path work including rock pitching, Drain building and landscaping. These techniques are all used as ways to encourage the many keen fell wanderers to use the paths and to help us prevent erosion. A small section of pitching Joe and I have been working on. The picture above is the view from the summit of Helvellyn (950m), in the middle is the famous/infamous Striding Edge, to the left is the cove containing Red Tarn, and furthest left Swirral edge. The cove is a fantastic place to sit and have your sandwich and take in the dramatic views. How ever if you happened to be sitting having your sandwich in the same spot 13 – 20,000 years ago you would be knee deep or potentially hundreds of feet deep in a glacier. Red Tarn cove is good example of a ‘glacial cirque’, at the start of an ice age these ‘glacial cirques’ are the locations where glaciers first develop and then spread down through the valleys below where they gouge and deepen the valley floors. When Glaciers retreat they do so back up to the Cirques where they began. Its also worth noting that if/when/how?!/really?? another Ice age were to begin these beautiful mountain tarns would again be the first places to form new glaciers. You have been warned! Our fell work season is now in full swing and we will certainly be busy. Over the next few weeks the South Lakes team will be working on projects across the park with the ‘Fix the Fells’ lengthsmen, working holiday groups and the West Lakes footpath team. If you’re out in the Hills and you happen to see us feel free to come and say hi!